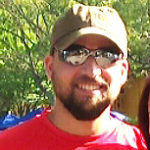 This guide is for version 3.0 of the BDX swap harness. Installation time is about 1 hour. 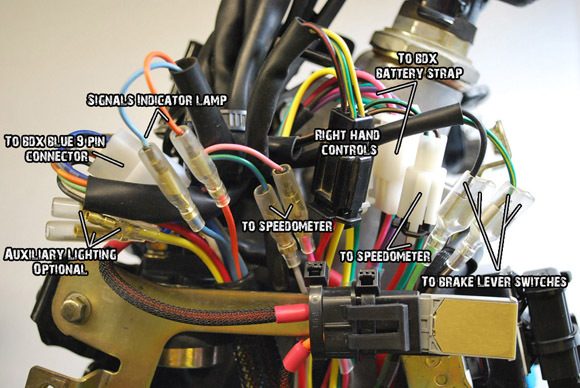 The BDX harness is built tight and precise, so it’s best to follow these directions exactly. We’ll step through the entire process. Your new harness comes with a 5 year / 20,000 mile warranty. 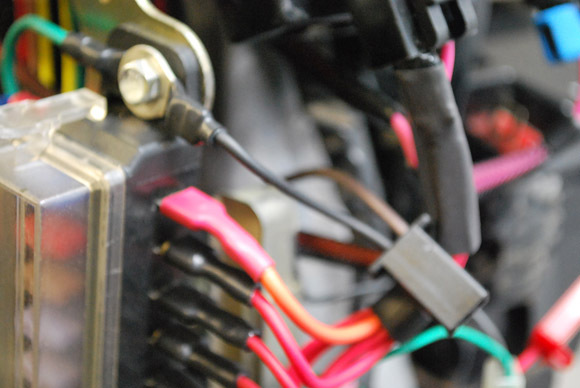 Don’t make any modifications to the harness or open the coverings, or you’ll void the warranty. 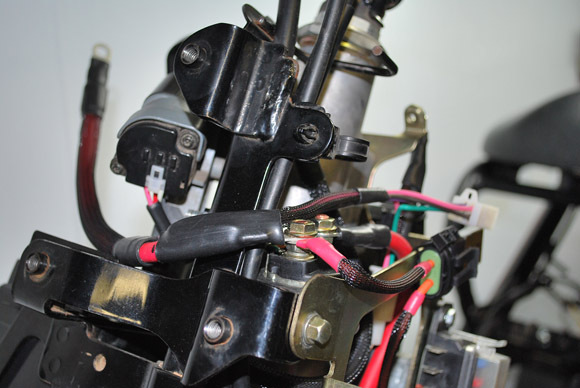 Contact Buggy Depot directly for help making your custom electronics plug-n-play with the harness. Even if you’re an expert installer, it’s best to follow this guide step-by-step, for the best results and an ultra-reliable electrical system even many years later. 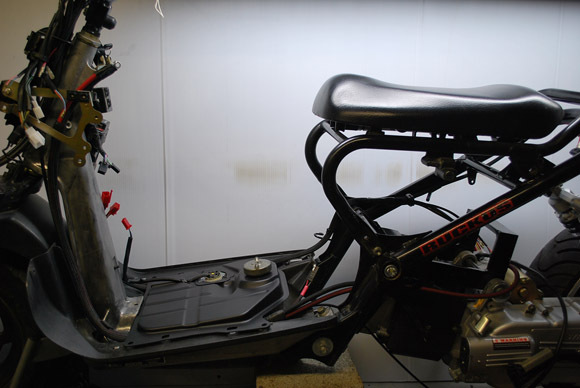 Start by removing the harness and components from the box. It will be pre-assembled for you. 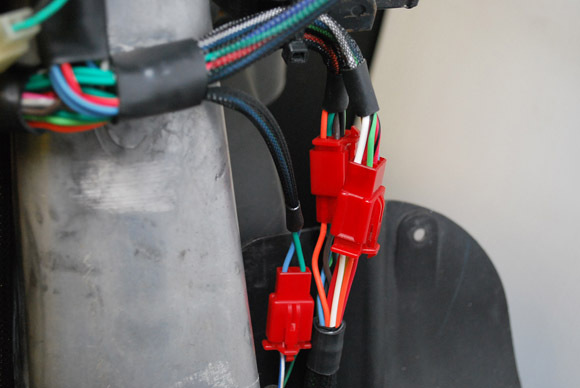 Be sure to take note of where components connect if you need to disconnect them during installation. There will be a few extra components included and connected. Other items may be included if you’ve bundled upgrades with your harness. Remove the battery box and the front headlight frame assembly. Don’t remove the wiring for the headlights or horn. Also, remove the bolts on the gas tank, but leave it in place. 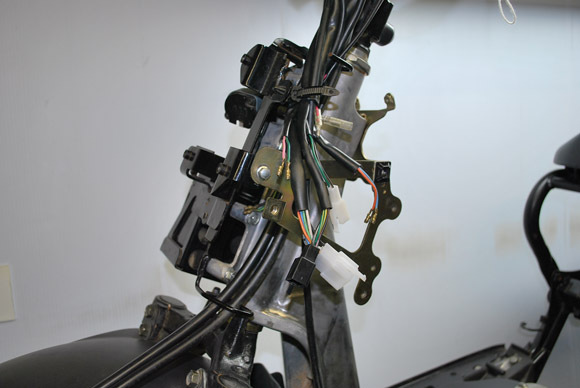 The chassis section has the hookups for your tail/brake lights, stator, ignition coil, automatic choke and turn signals. Grab it and let’s get started. Look at the picture below. 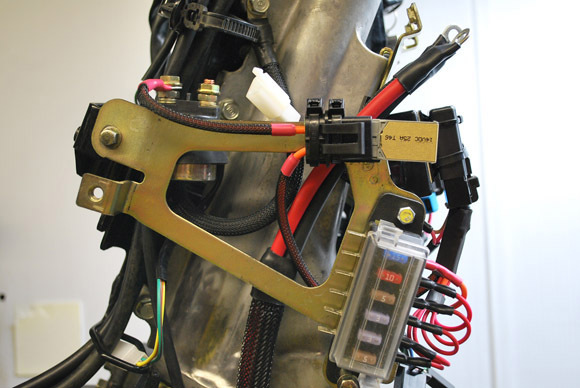 See that section of heat shrink on the harness, in the upper right corner of the picture? That’s called the junction. Make sure that lines up with the flexible harness clamp on the frame. The reason to line this up is so that all of your connections are in the right place for the next step. Once aligned, bend the clamp by hand to lock the harness in place. The picture below shows what proper alignment looks like. 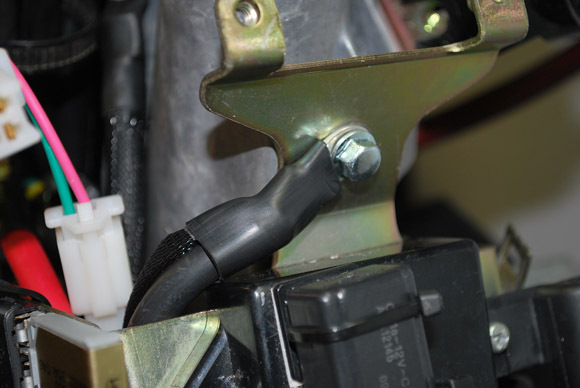 The rear lighting connectors should reach perfectly just past the clamp at the rear. 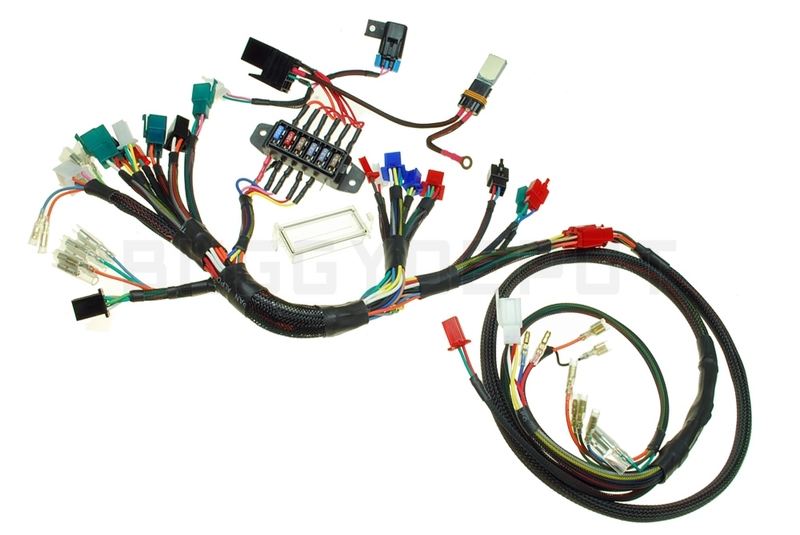 This harness uses the standard GY6 stator 4-pin + 2 bullet connector setup. 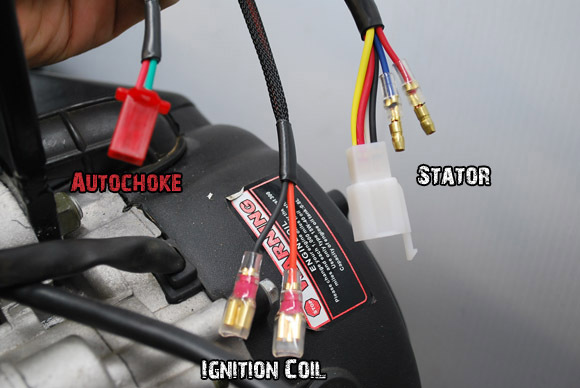 If you bought a stator from somewhere else with weird connector, contact Buggy Depot for an inexpensive Plug-n-Play adapter. Don’t modify the harness. The two 6-pin connectors below are called the chassis section front end. Nothing really to do with this yet. Unless you’re doing a wire tuck, just take a mental note of this for later. Grab the starter/ground cable section. It’s bundled into one assembly and is found at the bottom of the box. This is what your Ruckus should look like now (below). 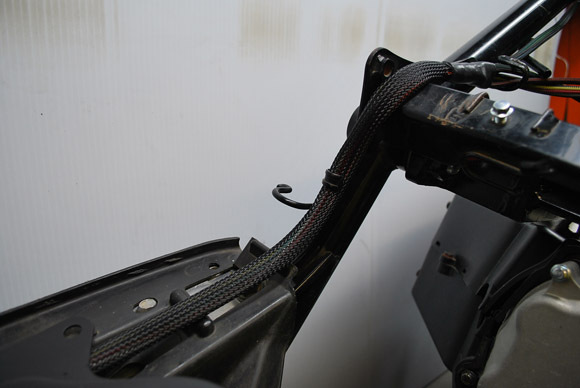 See how both the chassis section and the starter cables are routed under the tank? Do the same on yours. 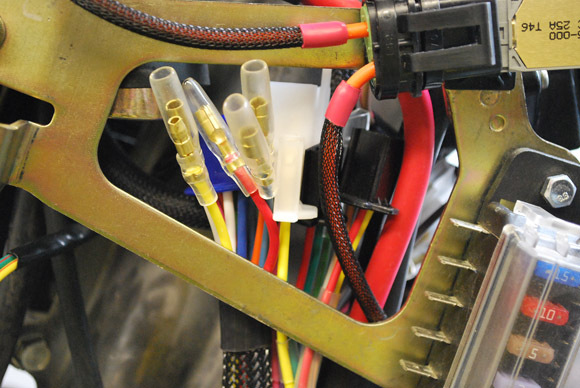 At the front end of the starter cables, run them behind the battery cage (golden colored) as seen in the picture above. Your GY6 starter should have already come with it’s own cable lead attached. It’s a weakling, and fortunately we’re not going to use it. Go ahead and use a cross-tip screwdriver to remove the cable. Keep the the screw. 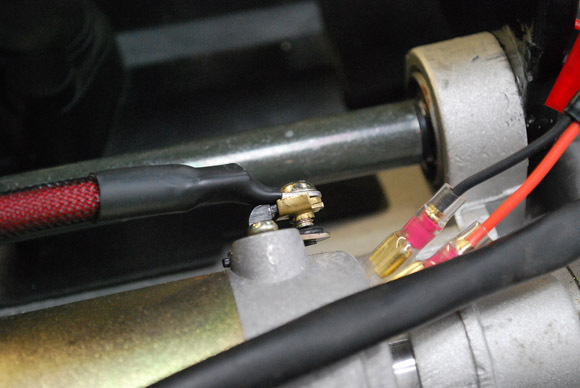 You’ll need to use the threaded tip at the end of the GY6 starter wire. Use some clippers to cut the end as shown below. Keep the threaded tip, throw the stock GY6 wire in the recycle bin. 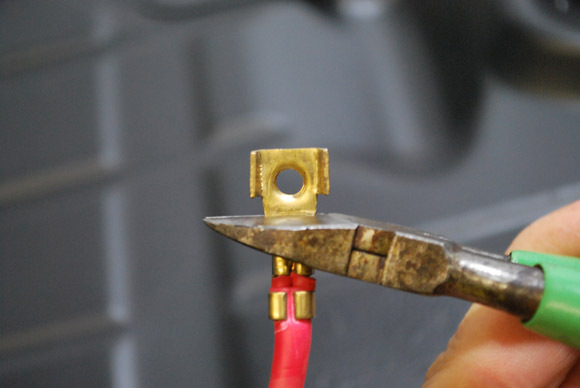 Use the GY6 wire tip and screw to lock the BDX cable into place on the starter tab. Slide the cap over the connection. The ground strap will be found at the bottom of the box. 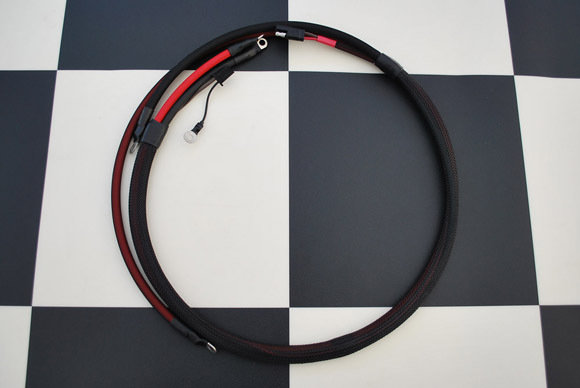 It’s a short thick black cable with ring terminals on each end, 9″ length. 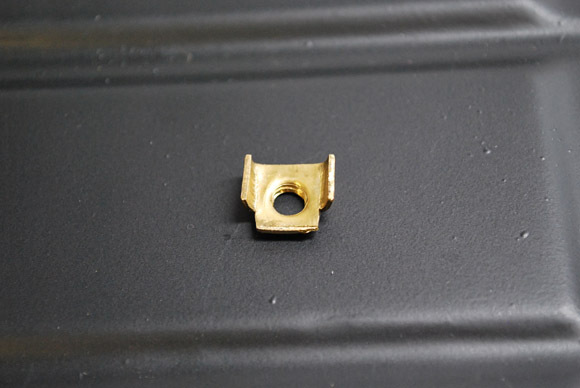 Attach one side to the bolt as shown. The other side attaches to the negative battery terminal. Now it’s time to hard mount the solenoid. No zip ties here. Grab one of the clamps from the bag included with the harness. Insert the solenoid exactly as pictured. Look in the hardware bag again and pull out one of the longer bolts. Use it here on the side of the battery box. 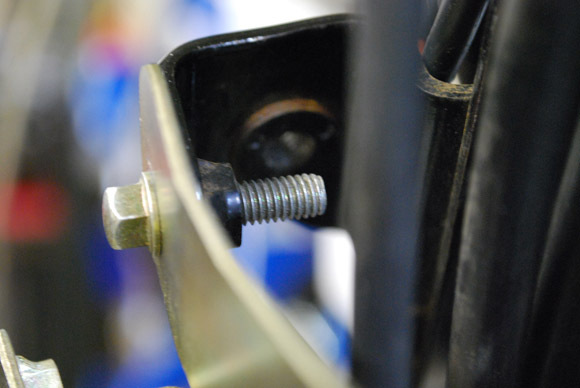 Mount the solenoid on the bolt, and tighten it down using the 10mm nut supplied in the hardware bag. One of the parts you removed from the Ruckus earlier is a large metal resistor. You need this in order for the low fuel light to work. Grab it, along with a smaller bolt from the hardware bag. Mount the fuse panel as shown below. Use the last small bolt, and the last large bolt at the bottom. Don’t tighten the lower bolt yet, you’ll need to mount something there later. Now is also a good time to attach two of the sticky pads to the upper-right corner of the cage, as shown. 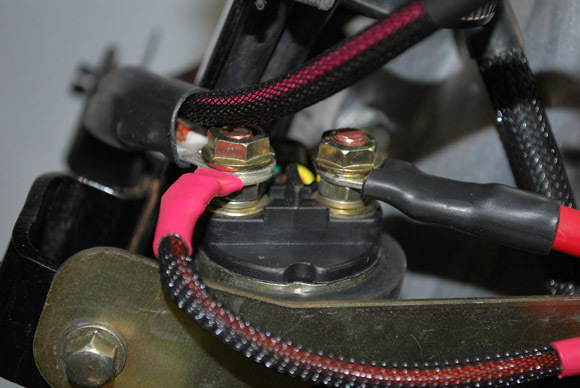 Use the sticky pads from the step above to mount the Auto-Reset fuse. It’s golden with “25A” printed on the edge. It’s towards the top-left of the picture below. 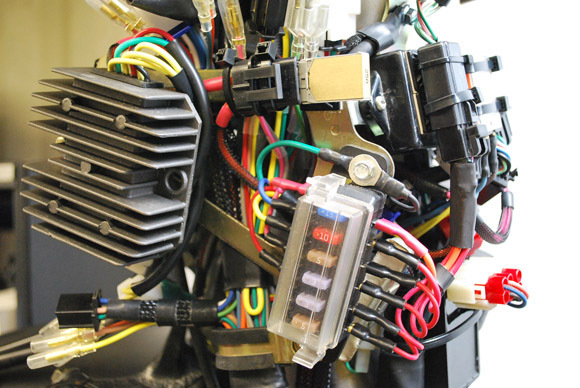 This picture is from the version 2 harness, which has a different relay. 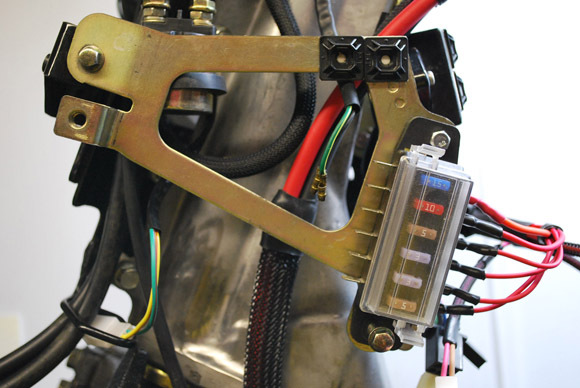 Your version 3 harness has been upgraded with a new relay type, now with a bolt hole for hard mounting. Remove the relay from its connector, mount the connector using the nearby screw (the left screw on the LED driver). The insert the relay back into its connector. The last part of this step is to mount the Key Fuse. It’s a holder with two pink wires. Mount it using the right-side screw of the LED driver unit. Check the last picture above again if you’re lost here. Be sure to connect it to the left side. 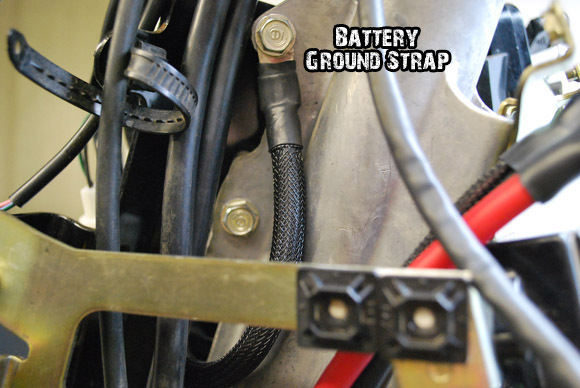 The battery strap consolidates constant and keyed 12v power sources. Be sure to install it exactly as shown in the pictures. At this point, connect the key switch using the appropriate connector. And the junction end of the battery strap to the left side of the solenoid. It should share the same post with the wire leading to the Auto-Reset fuse. Now pull the large red cable from the starter/ground cable assembly over and attach it to the right side of the solenoid. This cable shouldn’t share the solenoid post with anything else. You’ve likely disconnected the two plastic connectors on the battery strap by now, so now it’s time to reconnect one. The 2-pin (P|G) connects to the the PDS section that you mounted a few steps back. Leave the 4-pin plug disconnected. Connect the black cable end from the starter and ground cable section. It should be attached to the center bolt, above the LED Driver. Now for the main event. This is where the install gets really gratifying. Grab the main battery box section. You’ve most likely already disconnected it from the chassis section. Either way is fine for now. Pull the last clamp out of the hardware bag and mount it around the battery box section as shown. You’ll notice that the clamp has one straight edge, and another that is curved/bent to match up with the other. You should have the straight side facing you when looking at it like below. This is important. Remember the lower bolt of the fuse panel that you left loose before? Use it now to mount the clamp. Tighten it down once you’re happy with the fit of the bundles under the cage. Disregard the fuse amperage number in the pictures. As of version 3, the fuse ratings above are accurate. Don’t use any higher or lower rated fuse other than what is on the list above. This is one green wire with a ring terminal, coming from the same bundle as the fuse wires. 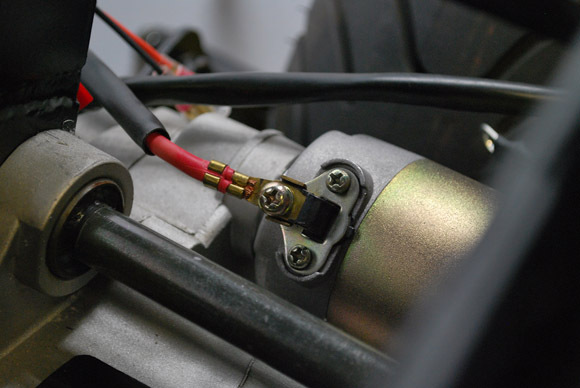 Now is also a good time to attach the black wire from the starter/ground section. It also has a ring terminal, coming from a 2-pin (BLK|BRN) connector. To make this step easy, be sure to have all of the bundles well above the top edge of the cage. Ignore the auxiliary lighting and the speedometer bullet connectors, these are obsolete features streamlined out in v3. 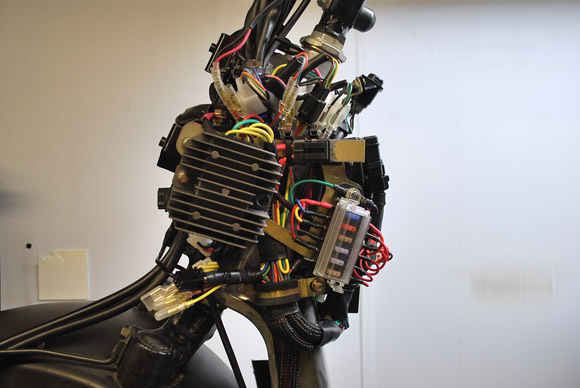 Then reconnect the chassis section, and don’t forget to plug in the fuel sending unit from the gas tank. 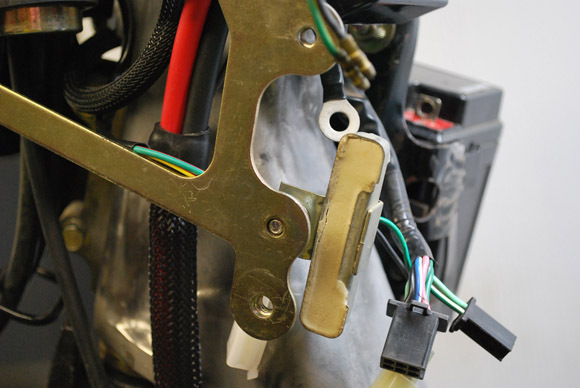 If your gas tank has a round grey plug at the fuel sending unit, contact Buggy Depot for a free adapter pigtail kit. 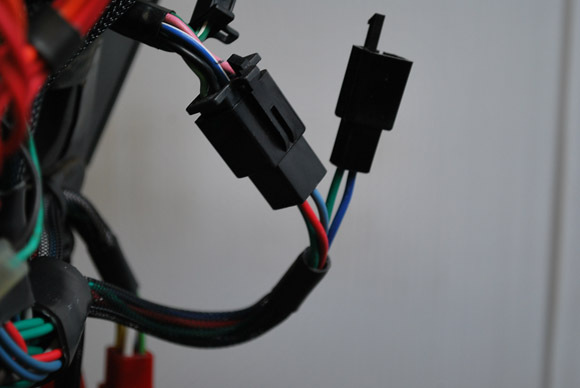 The adapter kit includes a new standard connector with pigtail, splice connects and adhesive-lined heat shrink. 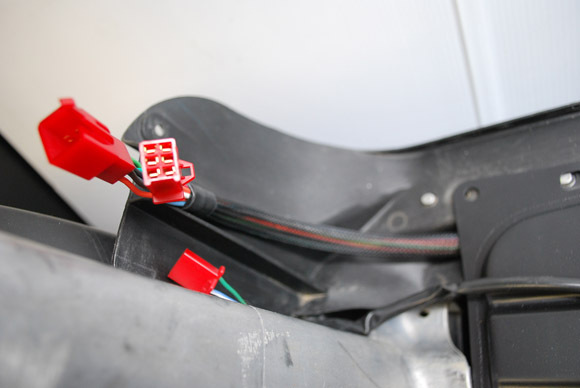 The new harness connector for the stock LED driver has 3 wires in a 6-pin plug (R|LB|G). Go ahead and connect it now. Connect the 2-pin (B|G) harness plug to the hi-beam indicator light. At this point you’ll have all of the battery box rear connections completed. 4-pin (Y|GRY|LGRN|LGRN) to the stock turn signal relay. Use the adapter that arrived connected to this plug. CDI Modules will always have a red 9-pin connector. Headlight module connectors are blue 9-pin. 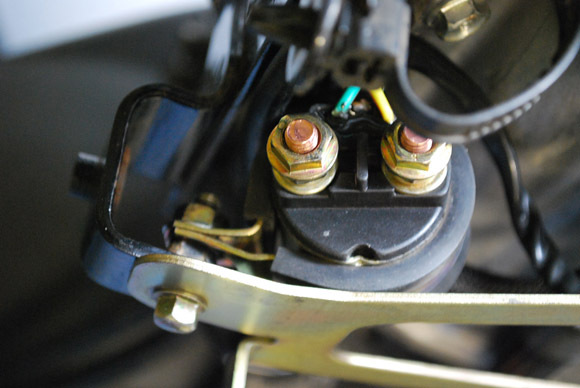 The standard Headlight module has a rocker switch for manually turning your headlights off while riding. 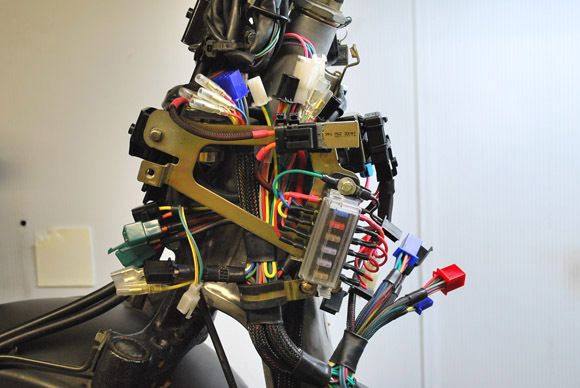 The module system will let you upgrade in the future without rewiring your harness for new functionality. 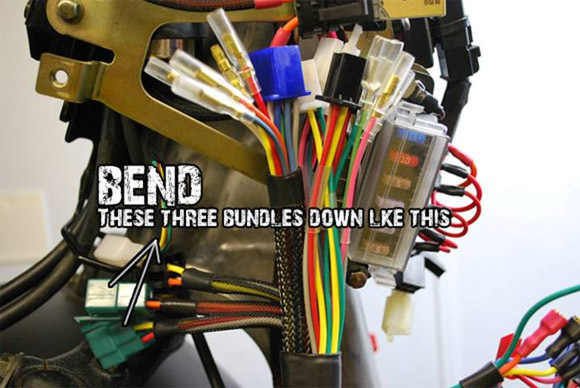 Remember the 3 bundles you bent down earlier while mounting the battery box section? Those three are your rectifier plugs. One black and two green connectors. You won’t use all three. Are you using a 6 or 8 pole stator? Connect your rectifier to the BLACK 4-pin plug in the next picture below. The two green plugs in the picture are to be left disconnected. Or are you using an 11 pole stator? Connect your rectifier to the GREEN 4-pin and 3-pin plugs in the next picture below. The black plug in the picture is to be left disconnected. 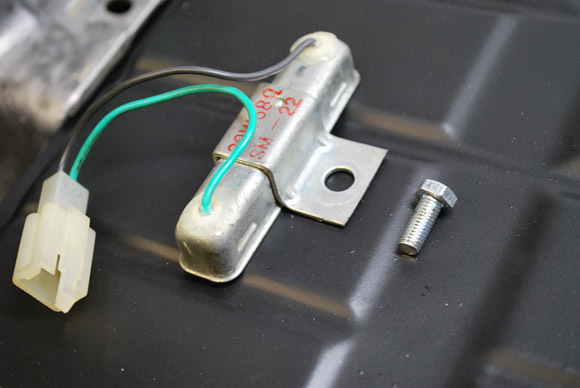 After plugging your rectifier into the proper plugs, mount it to the forward bolt on the battery box cage. You only have 4 more connections to go! At this point go ahead and reinstall the front portion of the battery box, and the headlight frame assembly. 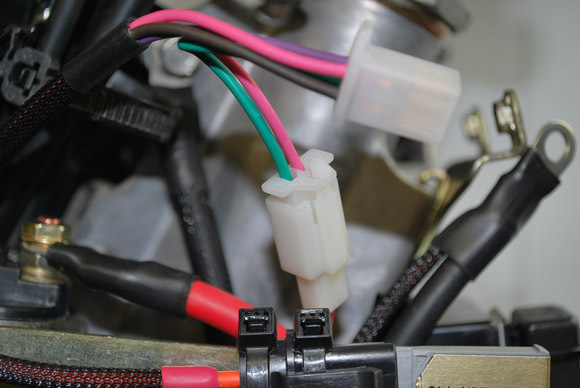 Look for the 6-pin connector (TAN|-|WHT|GRN|LGRN|B) on the harness. Plug it into the connector coming from the headlights. 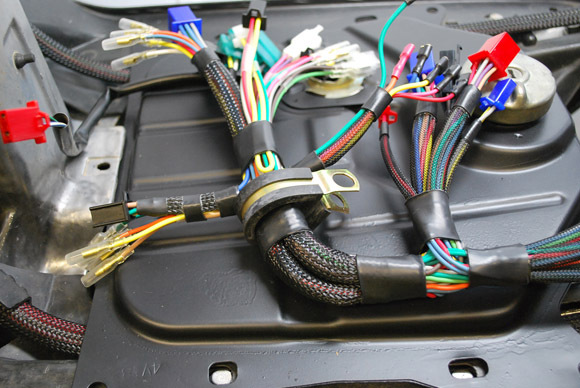 Now do the same for the green, orange, and light blue bullet connectors. These are your front signal wires. Does it seem like something got missed ? 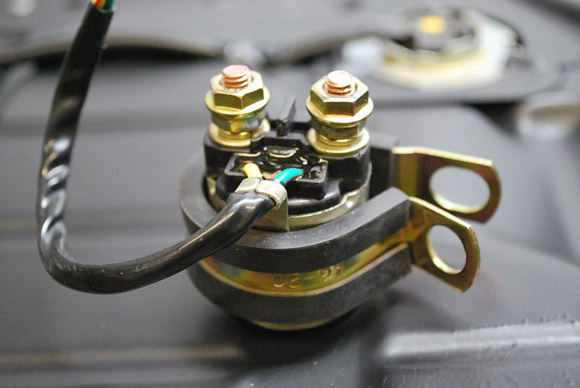 Rear ground cable: Gets connected to the lower-left valve cover bolt. I’ll update the instructions to reflect this. Signal relay: If you have standard indicators, you’ll need to use the standard relay. Headlights and tails are a separate system. Auto-choke resistor: You don’t need a choke resistor. 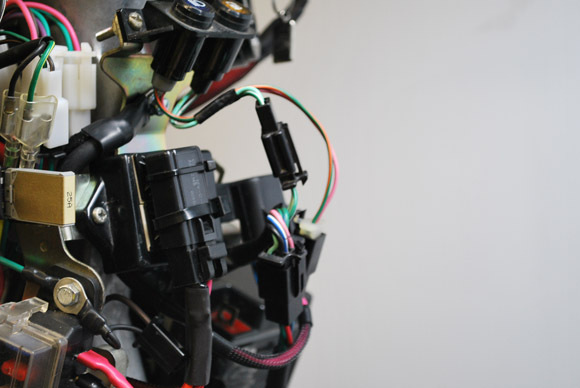 The harness is designed to eliminate the need for the resistor. (Y|Grn) black connector: Yes this is for the starter solenoid. The polarity (wire color) isn’t important. (R|Grn) black connector:This is for your stock speedometer. It’s keyed 12v, so you can power any kind of aftermarket speedo from it. Orange and blue wires: Turn signal wires. 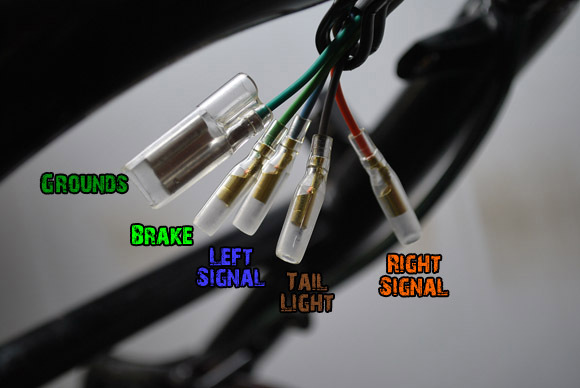 If you’ve already connected your front turn signals, then these two are for the stock dash indicator light. And with that, you’re done! 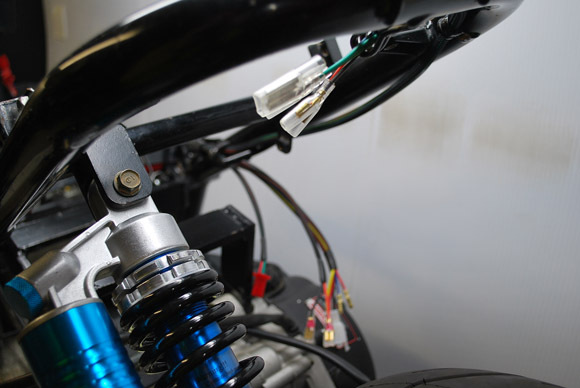 Before putting the battery box back on, go ahead and test the functionality of the bike. Make sure the battery is properly connected. Your headlights, tail lights, and stock speedometer will power up. Toggle the headlight controller switch on the harness off and on. The headlights should turn off and on accordingly. Test the turn signals. Confirm that all four lights work correctly. For technical assistance, ask your questions in the comments section below. 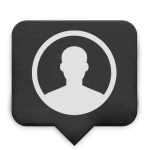 If you need to send pictures, use our contact us form to initiate a support ticket. If you have any suggestions for this guide, let us know below! 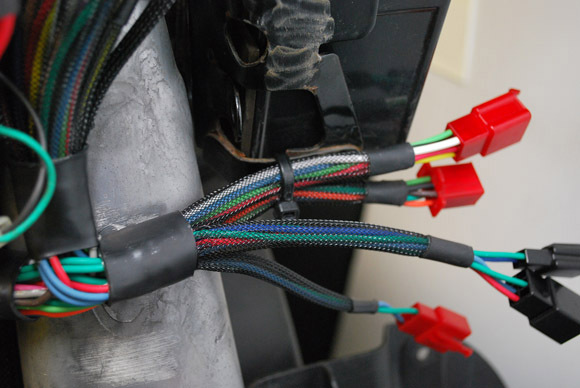 Fortunately the BDX harness is wired for almost every rectifier type, so whether or not the rectifier that you have will work is mostly determined by what stator is installed on your engine. Do you have an 11-pole stator? A 4/2 rectifier sounds like a single phase setup (almost all 11-pole stators are 3-phase). If that’s correct, it will work, but it won’t be able to take full advantage of the 11-pole stator’s higher electrical output. If it’s single phase it will perform more like an 8-pole stator. 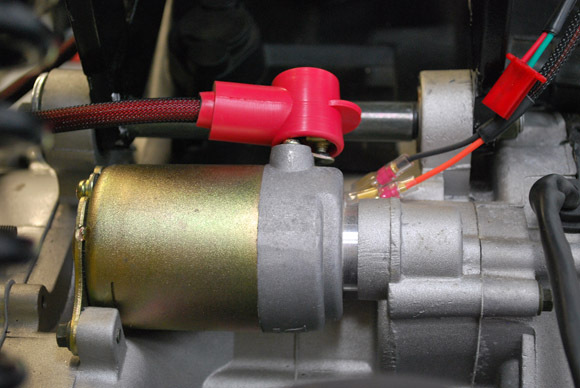 Does this harness utilize the oem fuel pump or do you need the vacuum fuel pump? A vacuum pump is currently required. We’re developing a plug-n-play module to run the OEM fuel pump. 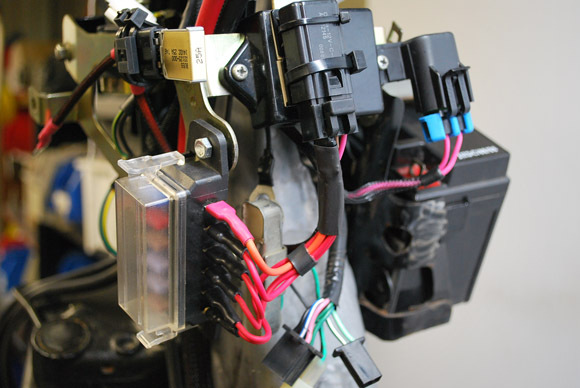 Compatible with all current and previous versions of the BDX harness. My Harness seems to be working but my Ruckus still won’t start. I’ve done everything that was instructed on this website but it won’t start. Instead I keep hearing a constant clicking sound around the solenoid area. Also my horn won’t work and the buck is constantly on. For example as soon as I connect the battery everything is already on even with the ignition key OUT. I must have missed a step somewhere. My I have some assistance please.